As I reflect on the many months of preparation for the March 26, 2018 Voices of Hope Holocaust Concert in Nashville, I want to express my gratitude for the work that you are doing and the impact that Voices of Hope had on my students. I want to thank you for the lesson plans, literature, original music, Holocaust history, artistic advisement and encouragement. The Face-Time session with you, along with Monday's dress rehearsal, both elevated our students to another level of choral artistry and knowledge. My students learned how the universal language of music connects people from all walks of life, across time spans and within cultures. During our debriefing and class reflections, the students' comments sent chills up my spine. On behalf of my principal, Miss Trellaney Lane and my students, our deepest thanks and appreciation to you for a wonderful, life-changing experience! - Nita Smith, M. A. Ed. Your presentation at Bergen Community College was outstanding from every perspective. Your enthralling rendition of the historic pieces was superb. Your playing of the beautiful viola, with its meaningful history, came alive in your skillful hands. From an educational perspective, your unique presentation created a spellbound audience. Your excellent interpretation of the music, and the unique manner in which you presented the material, provided a wonderful array of music for us. Your multiple talents enthralled the audience from the moment you began your presentation until its conclusion. Many thanks. Dr. Tamara Freeman combines her historical knowledge and her musical talent to present a fascinating story of Holocaust and Holocaust-inspired music. That her instrument is part of the story makes it even more compelling. I recommend Dr. Freeman for any audience interested in the arts or any group that wants to learn about the creative, heroic spirit of the Jews amidst the tragedy of the Holocaust. I am writing to tell you how wonderful a program you presented to our synagogue. People are still talking about it and asking why we cannot have more presentations of that caliber. You were magnificent. Thank you, thank you, thank you. “We were so fortunate to have Dr. Tamara Freeman's presentation in Memphis this year and your workshop has generated much excitement around the state. We hope to work with Dr. Freeman again soon in both Nashville and Knoxville! Our theme for this year’s west Tennessee annual Holocaust conference was Music of the Holocaust. We invited Dr. Tamara Freeman, Holocaust ethnomusicologist, to facilitate a workshop with educators and students from the west Tennessee area. Dr. Freeman brought her viola. She worked in advance with choir directors, music teachers, and a local survivor to prepare them to perform pieces during the workshop. She had prepared a handout for the students with songs that were composed in the ghettos and camps during the Holocaust, and performed the music for us. She shared the backgrounds of each of the composers and lyricists, including when they lived (and died), and provided the English translations. She involved the students in sharing what they were experiencing through the music, and in relating what they were learning from this music to what they already knew about the Holocaust. At the end of the session, the participants wrote poetry that reflected what they had learned during the workshop. It was incredible to see how moved they were by the music and the lyrics, and the stories Tamara told about the musicians. Most moving was a high school student who requested to sing the poem she had composed which prompted a spontaneous standing ovation. I am sure that most of the students who attended the conference expected to perform a piece and listen politely to their peers but much “accidental learning” happened during this workshop which I am sure these students will remember for years to come. Students spoke of what music means to them personally, in times of happiness and times of stress and sadness. They recognized how music was used to maintain Jewish culture and humanity even in the darkest times and, also, how composing, playing, and singing this music helped to maintain hope. As one of our conference participants wrote, “As we sang along with Dr. Freeman you could feel the hurt and pain of the composers. However, I finally realized that the soulful musical expressions gave the Jewish people hope and determination to survive. 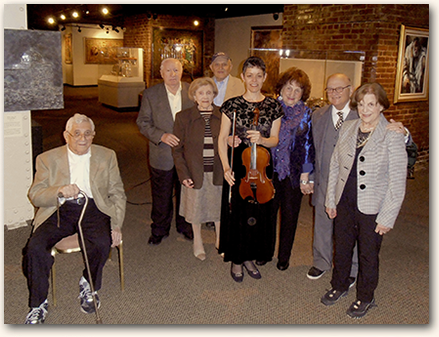 Their music of comfort is what helped Holocaust survivors like Mr. Samuel Weinreich cope with his daily struggles. What a positive way to tell a story that should never be forgotten. One of the most moving moments of this performance involved having survivors accompany her in singing "Zog Nit Keynmol" ("Never Say You are Walking the Final Road") composed in 1943. The presentation that Tamara gave us during Mass was profound and touching. Everyone is still talking about it. It was a completely different approach to our yearly study of the Holocaust, especially for a Christian Community that has been profoundly changed as weak at the horrific events created by mankind. Her presentation was spellbinding and moved everyone. We are all so grateful to have had her share her experience as well as her professional musical training and research.......The Rev. Dale L. Cranston, Rector, Christ Episcopal Church, Suffern, New York." “We are indebted to Dr. Tamara Freeman for bringing her immense musical and vocal ability, as well as dedication to Holocaust education, to our community, impacting and inspiring children and adults alike. 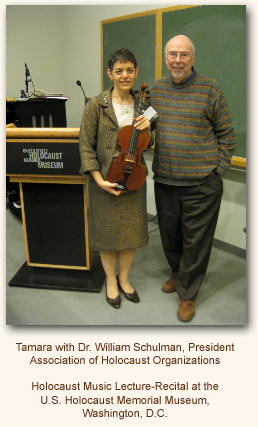 Dr. Freeman conducted six student workshops in which she both taught and engaged the students in the rich and moving history of music of the Holocaust. Her gentle demeanor and interactive teaching style involved the students immediately. Not only did they learn a new element of Holocaust history but songs and stories of individuals as well, truly personalizing this history for them. - Father Lawrence Frizzell, S.T.L., S.S.L., D. Phil.